This book is one in a series, The Liberia Signature Series, from the publisher, One Moore Book, which states as its goal that it “publishes culturally sensitive and educational stories for children of countries with low literacy rates and underrepresented cultures.” This picture book attempts to teach a moral lesson about corruption (gbagba in the Bassa language of Liberia). Instead it conveys negative stereotypes of Liberia, urban residents and Asian merchants. Twins Sundaygar and Sundaymah live in the coastal Liberian city of Buchanan and we meet them reluctantly packing for a two-week visit to their aunt and uncle who live in Monrovia, the capital of Liberia. The boy, Sundaygar, encourages his sister, “Come on. They always spoil us, with TV and hot water baths. His twin Sundaymah thinks of all she will miss in her home: playing football (soccer) in the street, eating dumboy (a starch) and pepper soup at a local shop and mostly, her school friends and her math teacher. They will miss their Ma and Pa and their Ma tells them to remember to be well behaved because she “knew that her children were just as well behaved as the children in Monrovia, if not more”(10). When they arrive in Monrovia by taxi, new sights and sounds await them, as they are greeted by their Auntie Mardie in her Liberian government car. She is a “big woman” in government and people “called her ‘minister’ ” (12). From their first arrival, the twins encounter numerous incidents of corruption, before they even reach their Auntie’s home: a thief attempts to steal their suitcases, Auntie’s driver bribes a policemen to let their vehicle through traffic in a special lane. The children are confused and disappointed when the driver gives the policeman a $100. Liberian bill, his “cold water.” Later their aunt ignores spoiled chocolate (it was not fresh like in Buchanan), even though she looked at the expiration date, because the shop merchant is her friend. When the children ask her, “What if he does it again?” she ignores their pleas. In the illustration, the store owner, Mohammed, looks South Asian. These incidents happen after they hear the President of Liberia condemning corruption in a radio speech, “Corruption is the enemy, in government and everywhere” (19). The twins do not know the meaning of the word corruption, but vow to look it up in their uncle’s dictionary. There they discover that corruption means “Lying, cheating, stealing” (37) and they recognize that it is the word in their language, “gbagba” or trickery (37). On the last page of the book the children recall their parents’ anger at incidents of corruption: the teacher who took school fees, the market woman who cheated their mother and the pastor who used church money to build a “mansion on the beach.” “They thought about gbagba, and the round ‘c’ word. They realized how much they did not like the word at all” (39). Despite the publishers’ stated intent, this book is neither culturally sensitive nor educational. There are problems with the format as well as the content. Much of the book lacks a balance of illustration and text. Pages 12, 36 and 39 are dense with text. They also have a didactic and scolding tone. Twenty-seven of 38 pages are descriptions of corruption in Liberia, and corruption with the approval and acceptance of their urban auntie. It is not clear who the audience would be for such a book. 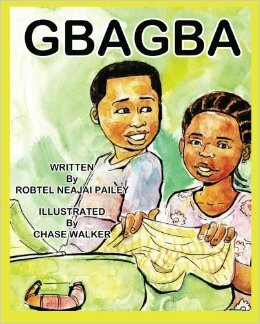 Even if this is intended for Liberian or West African children to read stories with familiar surroundings, corruption and theft do not seem appropriate topics for a children’s early reader. In addition, the dichotomy of the corruption of the capital city compared with the goodness of the smaller city is unfair to the complexity of human nature. The thief is a man with dirty clothes and the merchant who got away with selling spoiled chocolate is the only Asian in the book, and has a Muslim name. The illustrations are a plus. The children show their excitement, anxiety, dismay, and disappointment on every page. And the background scenes of daily life in Liberia are depicted with accuracy in brief strokes and warm pastel colors.